I remembered when Google+ was hinted at as one of the best ways to use Google Hangout online. Well now Google have launched a standalone website for Hangouts at hangouts.google.com. I the guess it’s related to the alphabet shake up, but part of me wonders if it could be a signal toward the end of Google+, as for me Hangout was the only reason I would ever visit the site. For me the new Hangouts website is far better than having to keep Google+ or Gmail open, my only bugbear at the moment is that the Background rotates randomly, which while mimicking the ChromeCast isn’t really what I want if I’m using the site at work. Please allow me to set a custom background or disable the slideshow. I’ve been using Google Talk for years now, primarily because it means I don’t have to have chrome running to use the chat plus the install is very lightweight. Along with with having different styles that allow me to just see the messages and hides all avatars of the chatters. Of course the best functionality was that I could login with the Google account of my choice not be FORCED to use the first one in my google account list as I seem to be with every non webpage embedded version of Hangout I try. So mid-Feb will see the product that I use nearly everyday retire and the replacement (Hangouts), suffers from the problem I mentioned above in defaulting to the first Google account on the device, plus the only option the app gives around accounts is to logout. After discovering that Dok (once an original poster here) was going to try out Neverwinter Nights last night, I fired up Steam and grabbed the launcher, thinking that I could download it in preparation and join him as I’d be interested in trying the game out. Now in terms of MMO’s, ignoring all game mechanics and graphics, there is one thing that truly pisses me off, that is launchers that won’t let you download the game without signing into the client. It was a problem that bugged me in the days of subscription but it removed the need to have logon functionality built into the game client, but in this modern day Free2Play Utopia why in the world doesn’t your game download from the start? Of course this was further hampered by the fact all the old Cryptic/Perfect World accounts are now pointing at the ArcGames website. The Arc games website is completely useless in giving any helpful information about how to reset an old account. The help FAQ was more concerned about telling me how to ensure I bought something. After a few attempts on logging on I attempted a password reset only to find that none of my email addresses could be found on the system. After trying to regain my account for over an hour, combined with the fact the game doesn’t download automatically, I gave up on the whole idea and deleted it. 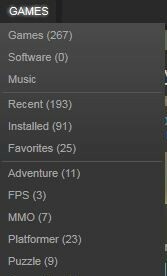 I have always tried to keep my Steam games list in some resemblance of organised. I would try and add new games into the category they belonged, this was good as the games list would reflect the categories which made life a little easier. However I now have over 260 games and what was originally a simple system becomes a little clunky as when the the tabs are expanded they expand beyond the screen and jump between them is more troublesome. 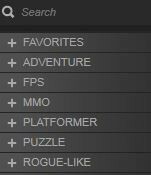 Thankfully the the latest Steam client update I can now filter by category, which is kind of cool when I know which game type I’m in the mood to play. Another nice point to mention is that games can be added to more than one category, which means that your FPS / RPG games can now appear in both lists. 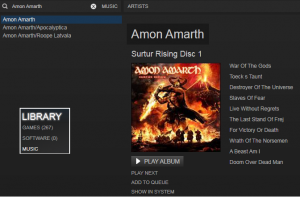 The final feature around this is the ability to hide games from your games list. YAY finally I can now hide that Left 4 Dead 2 Beta that has been on my list for the last god knows how long along with Chivalry: Medieval Warfare Beta. Another feature that I have been keeping my eye on is the Music functionality. As I mentioned in my previous post the music functionality only seemed to be available in Big Picture mode, I can’t seem to find when this changed but it’s now available in the standard Steam client. It’s worth mentioning that page loads on Steam are seemingly quicker in the applications browser based window after a Major update. Which is nice as in the last few years many of newer features like communities and badges have been a little laggy, while other parts of service seem to work just fine.